Joanna Katzman, MD, and Acting U.S. Attorney James Tierney. 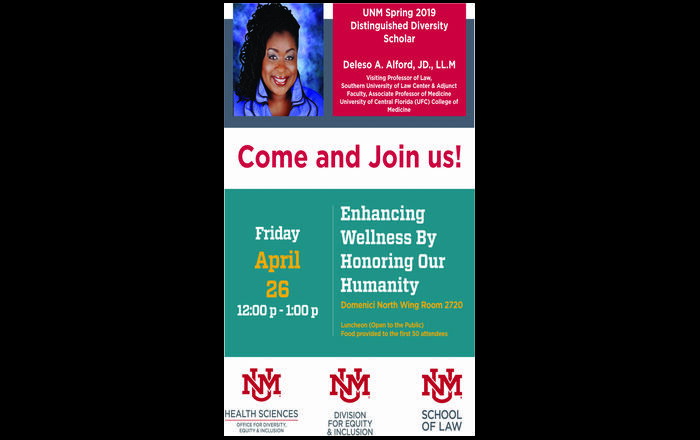 Six University of New Mexico Health Sciences Center (HSC) faculty and students were honored by the U.S. Attorney’s Office Thursday for their efforts in tackling the epidemic of opioid abuse in the state. The 13th Annual U.S. Attorney’s Law Enforcements Awards ceremony, held in the Albuquerque City-County Chamber, also honored federal law enforcement agents and local elected officials, and featured a tribute to former U.S. Attorney Damon Martinez offered by Paul B. Roth, MD, MS, chancellor for Health Sciences. Acting U.S. Attorney James Tierney hailed the UNM awardees for their role in the HOPE Initiative (Heroin and Opioid Prevention Education), a collaboration between his office and the Health Sciences Center launched in 2015. 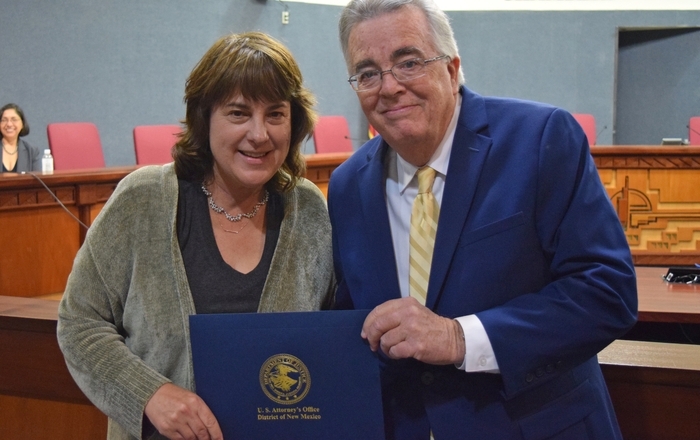 Joanna Katzman, MD, director of the UNM Pain Clinic, was recognized for her critical role in enacting first-of-its kind legislation supported by the HSC to make more widely available a life-saving drug that reverses the effects of opioid overdoses for New Mexicans. New Mexico House Bill 370 puts Naloxone into the hands of law enforcement officers and makes the medication available to individuals undergoing narcotic-replacement therapy and newly released inmates diagnosed with opioid addiction. Snehal R. Bhatt, MD, medical director of Addictions and Substance Abuse Programs at the UNM Psychiatric Center, was recognized for his efforts to improve access to addiction treatment in communities across New Mexico, exploring novel pharmacological treatments for addictive illnesses and educating medical students, residents and medical professionals. Bhatt is part of the HSC team combating the disproportionate misuse of opioids by Native Americans by using telehealth technology to provide training in chronic pain management to thousands of Indian Health Service providers. Chief Medical Investigator Kurt Nolte, MD, Medical Investigator Hannah Kastenbaum, MD, and Forensic Pathologist Karen Cline-Parhamovich, MD, of the New Mexico Office of the Medical Investigator (OMI), were recognized for their outstanding work. 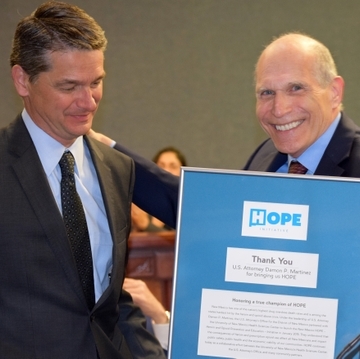 Thanks to their efforts, OMI has emerged as an integral information-sharing partner in the HOPE Initiative, working closely with the U.S. Attorney’s Office in an effort to create a real-time surveillance model for all drug-related deaths. 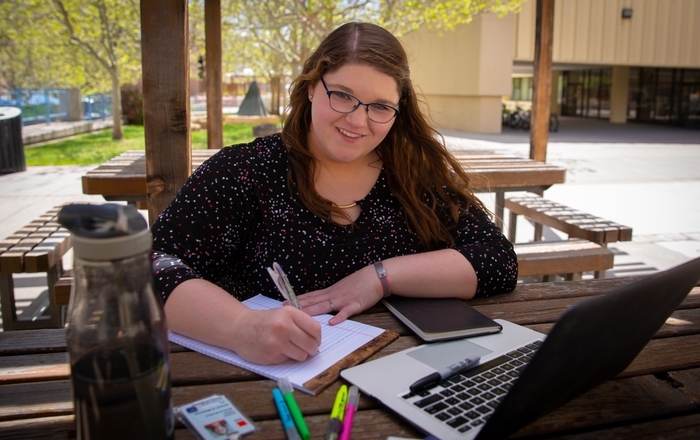 Brittany Haggard, a PharmD candidate at the UNM College of Pharmacy, is the 2016 chair of the Generation Rx student pharmacist organization. She was recognized for helping in the HOPE Initiative’s prevention and education efforts. Generation Rx educates middle school, high school and college students, parents and senior citizens about the dangers of prescription drug misuse. Haggard and other Generation Rx members collaborated with the U.S. Attorney’s Office and U.S. Drug Enforcement Administration in presenting prevention programs to thousands of students in 2016. Roth, who launched the HOPE Initiative in partnership with Martinez, said the pair hoped to tackle drug abuse on multiple fronts. Martinez and his staff reset their priorities to focus on prosecuting drug dealers instead of people with substance abuse disorders. The HSC meanwhile redoubled its efforts at providing drug treatment, education and prevention, Roth said.